Do you wish for warm floors? 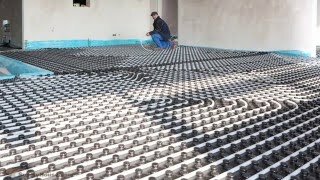 Radiant floor heat is easier and less expensive to install than you think. There are several installation methods depending on your needs and radiant heat can be used either as a primary or secondary heating source. Both electric and hydronic radiant heat are available so there's sure to be an option that works with your home. 3/8" 0.350" 0.500" (1/2") 3"
1/2" 0.475" 0.625" (5/8") 3.75"
5/8" 0.574" 0.750 (3/4") 4.5"
3/4" 0.671" 0.875" (7/8") 5.25"
1" 0.862" 1.125" (1-1/8") 6.75"
Why would you want radiant heat in your home and what are the benefits? Comfort is the biggest benefit. With radiant heat, heat is distributed evenly through the floors, warming them and then rising up throughout the rest of the room. When the floors are warm, the objects in the room (couches, chairs, and so on) become warm, and you become warm and comfortable. Radiant heat allows you to keep the average temperature a few degrees lower than you're used to but feel just as warm or even warmer. This saves energy and directly saves you money. Radiant heat is also silent with no creaking, rattling, banging, popping, humming or whistling. And there are no visible components with radiant heat so it will always fit in perfectly with your style. Why is radiant heat better than conventional heating systems? Comfort. Even heating eliminates the pockets of hot and cold typical of traditional radiator or convection heating systems. Instead of being warm right next to the heater and freezing on the other side of the room, radiant heat keeps the same temperature throughout the room by allowing heat to naturally rise. The 4 basic methods of installation are in-slab, joist, overpour, and wood panel tracks. When you decide to install radiant heat, you'll need to decide how you'll be doing the installation. This decision is largely based on the space available and the layout of your home. If the concrete slab has not yet been poured for new construction or a large remodel, an in-slab installation is the best way to go. With this method, you will lay out your loops of tubing, and then pour the slab. When hot water circulates through your PEX, the entire slab will heat up and radiate its heat into the room. The slab becomes a large thermal mass and will stay warm for a long time, meaning that your room will stay warm for a long time with little energy usage. This is also the most cost effective method. When installing in a slab, it is especially important to pressure test. If there is a leak, you want to know before you pour the concrete! If your floors are down but you have access to the joist spaces beneath them, joist installation is for you. When doing a joist installation, you will need aluminum joist trak panels to secure in the joist spaces and push the tubing into these panels. The aluminum panels will heat up and hold their heat to warm your room. With joist installation, you can also use suspended pipe installation where you do not utilize the aluminum panels. While this is less expensive to install, you will need to run hotter water through your tubing and it will not heat your room or hold the heat as well as with the aluminum panels. If you already have a slab, and do not have access to the joists, there are 2 more options for you. If you can raise your floors 2–3 inches, you can do an overpour of a lightweight concrete (mud or gypcrete) onto your existing slab. With this installation method, you will lay the PEX tubing onto your existing slab and then pour another 2 to 3 inches of concrete on top. The top layer must be poured so that there is a minimum of 3/4" of an inch above the highest point of your tubing. The new layer of concrete will be warmed in the same way as the in-slab installation, and this layer will retain its heat and pass it to your room. If you cannot raise your floors by 2 inches, you can utilize wood panel track radiant heating that will only raise the floors about a half inch. For this method, you can purchase wood panels and press PEX tubing into the grooves cut out of the wood. Some panels (such as the Quik Trak panels) have an aluminum heat transfer sheet built in and can easily be combined to fit the size and shape of any room. Both straight tracks and return tracks must be used to create your loops. PEX Tubing: Crosslinked PolyEthylene (or PEX) — make sure that it has an oxygen barrier for closed systems — flexible enough to bend easily and strong enough to be approved by all major plumbing and heating codes. 1/2" is the most common size for radiant heat. Manifold: The hub of your radiant heating system connecting to the supply and return lines through supply and return balancing manifolds, with as many ports as you have loops of tubing. 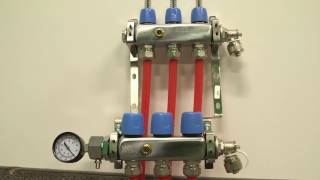 If you have more than 12 loops in your system, multiple manifolds may be necessary. For half inch tubing, no loop should be longer than 300 feet. Circulator Pump: Usually Taco or Grundfos, to circulate the water throughout the system. If there won't be potable water involved, a cast iron pump is a cost efficient way to get the job done. Check Valve: To assure that water can only flow one way through the system. Mixing Valve: Including mixing valves, I-series valves, mixing blocks and Tekmar controls. Boiler water cannot go directly into the hydronic radiant system, the water must be mixed with cold water, ultimately sending a maximum of 150°F water through your PEX to heat your floors. Thermostat: The interface between you and your heating system, the thermostat will control when the heat is turned on and how long it stays on to achieve the desired temperature in the room. Sensors: In-slab sensors will communicate to the thermostat the temperature of the slab while floor sensors will communicate the surface temperature of your floors to prevent any gapping, cupping or warping due to excessive heat. Expansion Tank: To maintain proper pressure within the system. Air Eliminator: Removes all excess air from the system to ensure silence and a steady water flow during operation. Zone Valves: If you want to keep different rooms at different temperatures, you will need to create separate zones. Pressure Test Kit: Make sure to test the pressure in your system to ensure that there are no leaks. Testing should be done at maximum system pressure before, during, and after an installation to be sure the system is running properly before you put it to work. Which Style of PEX Tubing? The "barrier" referred to in PEX tubing is actually an oxygen barrier. This extra layer in your tubing will assure that no oxygen gets into your heating system. Oxygen in your system can be a problem that causes your system components to rust. The oxygen barrier and rust prevention allows you to use cast iron components in your system instead of all brass or bronze, which makes components like pumps and flanges substantially less expensive and keeps them running smoothly for longer. Antifreeze can also break down a system with no oxygen barrier. For radiant heat applications using closed systems, barrier tubing is by far the most popular choice. Examples of barrier tubing include Wirsbo hePEX, Thermapex Tubing, and HydroPEX Barrier Tubing. This style of tubing will save you money when buying parts and will prevent rust and corrosion. Non-barrier tubing is simply PEX tubing without the oxygen barrier. For potable water applications, you will generally use non-barrier PEX. Oxygen barrier PEX is made for heating applications and has thus not been approved for plumbing and drinking water. When using tubing without an oxygen barrier, you must be careful to assure that each and every component in your system is non-ferrous (meaning that it contains no iron). Non-barrier PEX Tubing is rarely seen in radiant heat systems, the few systems that do utilize non-barrier PEX are open systems. Non-barrier PEX for plumbing is available in red, white, and blue. Typically, red is used for hot water and blue is used for cold so that you can immediately see which line goes where when looking at a manifold. White can be used instead of either or both colors as all three colors are made of identical material. Non Barrier PEX Tubing includes Wirsbo AquaPEX, ViegaPEX, and HydroPEX Tubing. PEX-AL-PEX is a three-layer PEX Tubing that also has an oxygen barrier. PEX-AL-PEX is a layer of PEX, a layer of aluminum, and another layer of PEX. The main benefit of PEX-AL-PEX is that it holds its shape. Where traditional PEX is flexible, there is nothing that keeps it in place unless you tie it down every few feet. With PEX-AL-PEX, once you bend it, it will hold that shape until you bend it again. PEX-AL-PEX also has less expansion than standard PEX with the layer of aluminum assuring that it keeps its shape. PEX-AL-PEX is frequently used in outdoor heating applications, warmboard systems and for high temperature systems like baseboard and fan coils. Mr. PEX-AL-PEX, Wirsbo Multicor, and FostaPEX are all examples of PEX-AL-PEX Tubing.